In the shadow of the massive semaphore signal gantry at Southampton Central, modified 'West Country' 4-6-2 No. 34016 Bodmin brews up ready for departure as a sister locomotive in original condition brings in the Waterloo-bound "Bournemouth Belle". 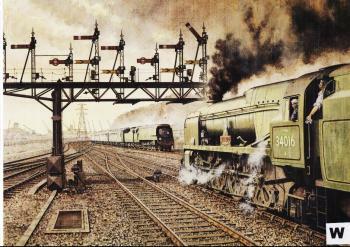 The route between Waterloo, Southampton and Bournemouth was the last steam-worked main line on BR. And it was the place where express steam went out with a bang rather than a whimper. Right up to the completion of electrification in July 1967 it was possible to experience the thrill of a clandestine 100mph behind a hell-for-leather driver determined to bid farewell to steam in style. Predominant on the service were the magnificent Bulleid Pacifies. Oliver Bulleid, the maverick chief mechanical engineer of the Southern Railway, introduced the first of his 4-6-2s - the 'Merchant Navy' Class - under conditions of wartime secrecy in 1941. Four years later they were followed by a slightly smaller, lighter variant, the 'West Country' Class. Both types were packed with novel features including Bulleid's patent valve gear, driven by chains enclosed in an oil bath, and boxpok wheels made of solid castings with cut out holes rather than spokes. The locomotives had a streamline casing officially described as 'air smoothed' which was intended not to increase their speed capabilities but to ease maintenance in the difficult war years. In theory the locomotives were to be cleaned by putting them through the carriage washer rather than waste manpower by hand cleaning them. In theory anyway. Be that as it may their distinctly tinny appearance led to them being nicknamed 'spam-cans', a name that stuck to the end when it was being used by schoolboy spotters who'd probably never seen a tin of spam. The Bulleid Pacifies were always free steamers but the tricky bits were difficult to maintain. All 30 of the 'Merchant Navy' Class and many of the light pacifics were extensively rebuilt - or 'modified' - in the 1950s producing some of the finest express passenger locomotives to run in this country. Thankfully, examples of both before and after versions survive in preservation including Bodmin which can be seen at work on the Mid-Hants Railway at Alton. The Bournemouth electrification also put an end to the "Bournemouth Belle" - the last steam hauled Pullman - and re-signalling with colour light signals took away the semaphores. Boat Trains continued to run from Waterloo direct into the Ocean Liner Terminal in Southampton Docks, serving the great ships seen against the skyline, but much of their glamour was diminished. The 1967 electrification was a relatively cheap affair and 20 years on new trains are being built by Network SouthEast to coincide with the extension of the third rail to Weymouth in May 1988.